Blogger outreach can be challenging. When it comes to finding an influencer to partner with your brand, your options are many. Popular bloggers deal with a barrage of offers making it a competitive environment. Finding the perfect fit can take hours of work, and once you find them there is no guarantee it will all work out in the end. Once you’ve found the one, you want to take every precaution to peak their interest and increase your chances of getting a response. Here are ways to increase your odds for success in blogger outreach or for finding social media influencers. 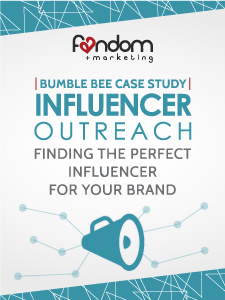 In addition to the tips below, download our in-depth step-by-step case study featuring Bumble Bee Seafoods blogger outreach. Work on finding the influencers actual email instead of their basic contact form. It shows you made a real effort to contact them and comes off more personal. It will also go straight to the top of their inbox so they are probably more likely to read it before they check the folder or website for contact inquiries. A little tip if the email is not apparent on the website is to right click then open in a new tab the contact form submission button. It will open a new tab, and in place of the web address will display the email (does not work all the time). No one wants to do business with someone when it feels like they aren’t making an effort. Sending a generic email that leaves out the name or any other form of personalization makes it seem like you could care less who your influencer is. Make sure to call them by their first name at the very least at an attempt to personalize your outreach. Make sure they know what to expect from you. Let the person know what you are looking for in an influencer. This will speed the process up and weed out anyone who doesn’t want to commit the time you are looking for from making it to the next step. Include why you want the blogger or social media influencer to be apart of your brand. If they have a spunky personality that matches your brand message, tell them! Or if you really enjoy an article, photo, or tweet from them, link to it, attach it, or quote it in your email. Blogger outreach can bring big returns on word-of-mouth marketing, audience reach, and backlinking. All of the work is worth it if you partner with the right fit influencer.